Spoofing on phone calls. Nice. "Burning" a communication device has been a mainstay of those interested in privacy, from the IMF (you know, from Mission: Impossible) to the corner boys on The Wire, and everyone in between. Those of us who aren’t superhuman secret agents or clever criminals may have a much more mundane reason for wanting to create a temporary phone number that routes to your actual number. Someone creating an online ad, a telemarketer trying to appear local so you'll pick up, or an uncertain party in a blind date could all use a throwaway number. Enter Burner, an iPhone app that debuted on Wednesday. 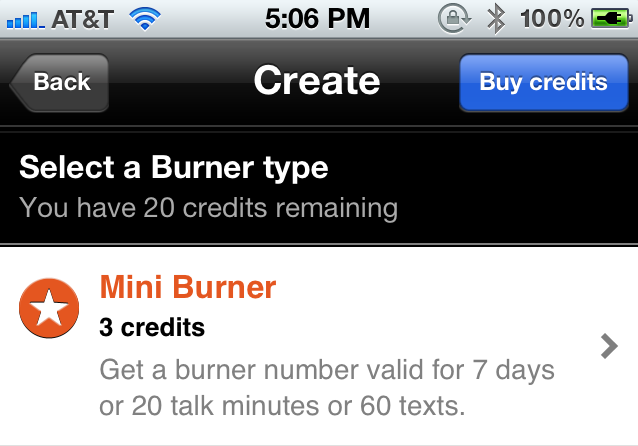 Sure, these days, you can use Google Voice, SkypeIn, or a number of any other services, but what’s nice about Burner is that you can do it from your own iPhone (an Android version is coming soon) in an instant. All I had to give Burner was my phone number. The company doesn’t even know my name or have my e-mail address. And yes, as expected, some people are already using it to create "casual encounters"-style personal ads (possibly NSFW). I created my own Burner number in about 20 seconds. It defaults to your actual area code (in my case, 510), but you can choose a different one if you like. The app costs $2 and comes with a single temporary phone number and enough credits for a 20-minute phone call, which I burned through (excuse the pun) while on the phone with Greg Cohn, the co-founder and CEO of Ad Hoc Labs, the app’s parent company. Users can buy more numbers or add credit if necessary, or disconnect themselves from the temporary number by "burning" it in the app.